There’s an interesting new wave of wooden constructions emerging in our built environment. Increasing know-how in the production technology and possible applications of Cross-Laminated Timber (CLT) sure looks very promising. There’s a growing need in the construction industry to renew the range of products and operational models towards more industrial approach and advanced prefabrication. Sometimes a little help from research and development organizations is also needed to facilitate industry towards new direction. With this in mind five organizations from the northernmost parts of Finland and Sweden joined forces and started a research and development project called Future possibilities for CLT (aka. Nya möjligheter för CLT). Each of the organizations (explained in the next chapter) has it’s own, unique take on the development process. Right from the start the core idea has been, that we are stronger together than individually. The basis for arctic co-operation and cross-border expertise has been found also in the field of CLT construction. The Future possibilities for CLT (FCLT) project is implemented as an Interreg Nord research project involving the Luleå University of Technology, RISE Research Institutes of Sweden Centria UAS, Digipolis Oy and Lapland UAS. The project was initiated in September 2015 and will continue until October 2018. The primary objective is to promote the diverse use of CLT and increase awareness of the possibilities provided by CLT construction. The responsibility of the work package coordinated by the Lapland UAS is to generate information regarding design and worksite processes of CLT construction and sustainable construction. The tasks of the work package analyse the current practices of the region’s construction sector and create example CLT integration strategies in co-operation with pilot companies based on the existing knowledge base and current situation. service class 3 materials are used outdoors vulnerable to weather stress. Digipolis does not have their own work package on the project, but they have been doing a lot of work in the work package coordinated by Lapland UAS. In addition to the study done in Lapland UAS work package Digipolis has been studying decentralized CLT production models and gathering parties for CLT innovation network. Centria UAS is activating the local companies by offering fast prototype testing involving CLT structures. In addition to fast prototypes they are studying CLT surface treatments and composite structures. Lapland UAS was requested to take part due to the experience on similar studies such as CLT-test house project and EFCONE project. A research study concerning CLT concrete composites was conducted in Lapland UAS. The subject of the study fell in the LTU´s work package, which studies new building solutions for CLT and therefore LTU was consulted about the research before any tests were conducted. LTU approved the co-operation between work packages and gave some propositions about the attributes that which could be studied about the new CLT concrete composite structure. 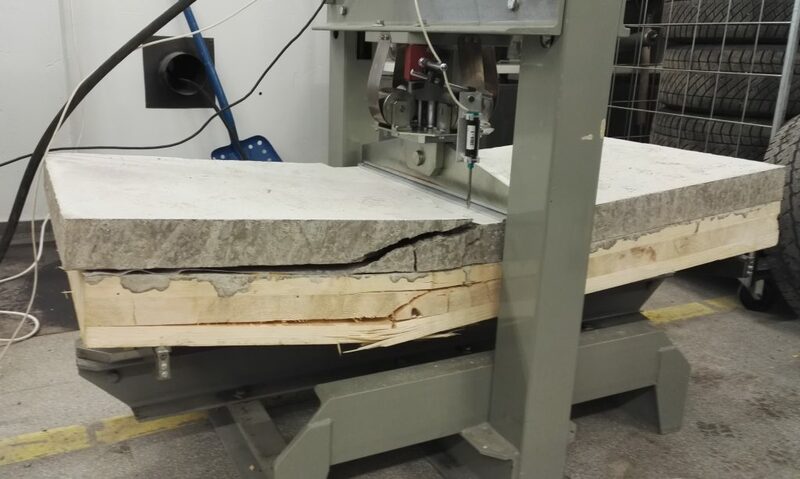 Lapland UAS decided to study how the added composite concrete layer affected CLT´s structural properties with a bending test. Flexural strength and stiffness were measured from CLT concrete composite element and the acquired results were compared to results from a bare CLT element. Full research report is published in Finnish by the title of “CLT-betoniliittorakenteen lujuusominaisuudet”. Figure 3. CLT concrete composite element after the bending test. As we have discussed in this article, the Future possibilities for CLT has been about realizing potential for using CLT in new ways. One of the goals in the project has been to create a wider base for development work, extending further into other European countries. This target was addressed late in the year 2016, when the organizations behind FCLT project created a multinational consortium, which prepared a Horizon 2020 application. The core of the consortium came from FCLT partners and the partner-base was widened with excellent partners from Hungary, Austria and CLT-based industry. The main idea behind the applied project was to find ways to improve the durability of CLT structures against outside conditions. 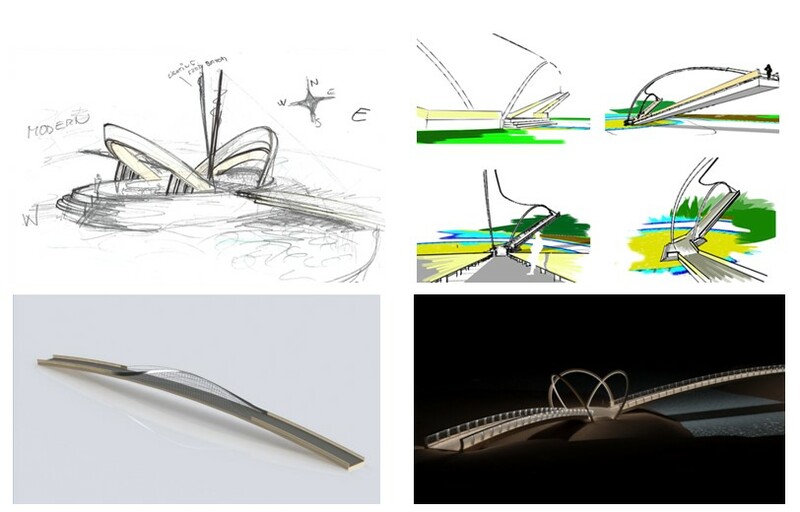 Although it was unfortunate that the application didn’t get selected for the 2nd phase of the application process, the feedback from the process and newly found partners in the CLT research network can be viewed very valuable results. Lapland UAS´s aim is in the helping of accommodating CLT in local construction entrepreneur’s business models and other actors in the construction field, such as structural engineers and architects. With this goal in mind, two workshop days are to be held in October and November 2017, where entrepreneurs are given a chance to familiarize themselves with the basics of designing CLT structures and the procedures of CLT construction. The project as a whole is heading towards final active phase. The partners are looking forward to even more co-operation and one concrete example of this is highlighted in November 2017, when FCLT partners are doing their part in organizing Wood Building Summit in Skellefteå, Sweden. The project partners will be presenting results and views gained from the project in their own segment during the Summit. The arctic co-operation in the field of CLT construction has been found to be successful so far. During the project life-cycle much has happened regarding the expectations and new openings on using CLT in construction industry and the odds are that the research and development will continue in new ways after this first mutual journey.